Main- and auxiliary hoist line on mobile- and truck cranes. Often used as a single point line. Large lifting heights will require a tag line to prevent excessive spinning of the load. Smaller sizes (< 3/8") are sometimes used on overhead cranes. NOT recommended for construction tower cranes. Using the rope to its maximum fatigue life will cause the rope to deteriorate from the inside out. Sudden rope failures may be the result. For this reason we do not recommend this construction for tower cranes. There have been fatal and catastrophic accidents involving this rope construction because of undetected inner rope fatigue. However, mobile and truck mounted cranes are operated on a much less severe duty cycle and it is not expected that 19x7 has to be replaced because of inner rope fatigue but because of other mechanical damages. Keep in mind that this statement covers normal mobile crane use. If you use a mobile crane like a production crane you WILL experience the above mentioned danger situations. PLUS, regular type 19x7 does not spool very good on multiple layer drums; there is too much strand interlocking causing excessive rope abrasion. but NOT non-rotating (Class II). Do NOT use class 19×7, 18×7, 17×7, or 24×7 wire rope attached to a swivel or have one or both rope ends rotate freely under load. Doing so will result in a loss of rope strength of between 30% to 40%. Block Twisting (Cabling) will occur when used exceeding certain lifting heights. This is NOT a non-rotating rope. Call for advice. Note: The maximum CAPACITY, WORKING LOAD LIMIT (WLL), or LINE PULL of the rope usually is 1/5 of the below stated values. 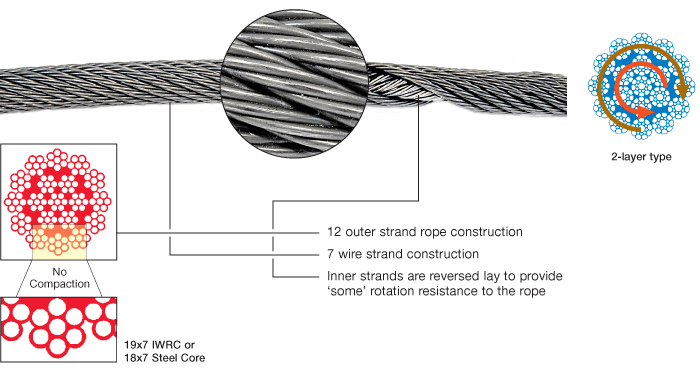 For specific information consult the standards applicable to your rope application. Traditional style type rotation resistant rope mainly used on older mobile, truck and yard cranes. Not recommended for tower cranes. Metric rotation resistant ropes are mainly used in small sizes for overhead- or shop gantry hoists applications. Use them only if absolutely required (block starts to spin). Most smaller sizes are Made in Germany.